Last year I did a post on one of my favorite television series, Thundercats. A fantasy/sci-fi series for children, Thundercats revolved around a handful of humanoid cats, some of the last survivors of their race. It had magic, science fiction (sort of), and cats. For me, it was irresistable. One of the seven Thundercats in the series was Panthro, voiced in the ‘80s by the late Earle Hyman. The strongest of the Cats, he was almost unbeatable in hand-to-hand combat. Based on the panther, he had blue skin, was bald, and had ears that immediately put me in mind of a Star Trek Vulcan. He quickly dispelled whatever illusions I might have had about his sharing the Vulcans’ stoic refusal to show emotion, however. Panthro was one of the most cheerful characters I have ever “met.” He loved to laugh, which I found contagious when I began watching the show. He was a happy warrior; in battle he liked to taunt his enemies, a wide smile on his face. In the first episode he jumped into a formation of Jackalmen, one of whom tried to hit him in the back with a mace. 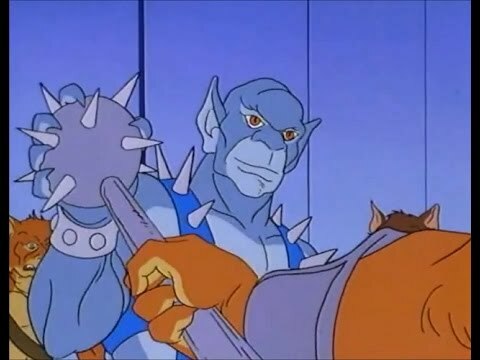 Quick as a cat, Panthro turned and caught the weapon’s head, chuckling as he did. “If you were as mean as you are ugly,” he said, “then maybe you’d be trouble!” After this, he promptly crushed the mace and started throwing punches. 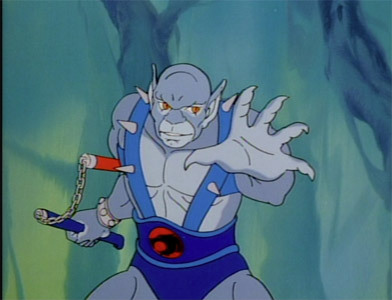 The writers for the original Thundercats series stated that Panthro’s character was “based on strength.” This is why he was, physically, the strongest Thundercat in the series. But his might did not show just in his feats of physical power or fighting prowess. It showed in his hearty, barrel-chested laugh and firm commitment to his fellow Thundercats, along with his adherence to the moral Code of his home world, Thundera. Panthro could be serious and he could be frightened. He could also be angered. But none of these emotions ever made him lose his head. He was strong enough to admit, at least to himself, that he was afraid or angry, and then focus on the task at hand. 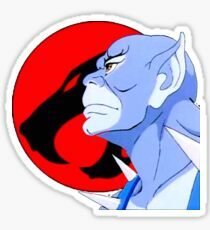 Of all the Thundercats, Panthro was probably the best fighter, not only with his bare fists but with his signature weapon. This was a nunchuk with a red and blue baton attached at each end. A technological genius, Panthro hid different tricks in both batons that he could activate in certain situations. His spiked suspenders could also be used offensively, though Panthro did not often activate them as weapons. The spikes could be fired from the suspenders so that they would plunge into a rock wall or some other surface. This would anchor Panthro and halt any tumbles he took, preventing him from falling splat to his doom. It was possible, too, for him to fire these spikes out and have them windmill around his torso, forcing opponents to back off fast. The weapon he loved most, though, was his Thundertank. Remember when I said Panthro was a tech genius? After the Thundercats crashed on Third Earth, he salvaged the machinery he could from their wrecked ship and put together the Thundertank. Though he later built other vehicles for the Thundercats, along with most of the machines in Cat’s Lair, the Thundertank was Panthro’s “baby.” Even Lion-O was not allowed to use it without his permission; the one time he did, he almost crashed it. While he was not my favorite character in the series, I have to say, I loved Panthro a lot. In the 2011 series….I had a few issues with the way the writers re-presented him to modern audiences. Voiced by Kevin Michael Richardson – an actor whose talent I greatly respect – the writers made the 2011 series’ Panthro a bigger, brawnier, and taller Cat than he had been previously. I think I could have accepted this change, but the fact that they also made him broody and angry upset me a great deal. Gone was the laughing warrior with the wit that cut like ice and the quicksilver smile. In his place stood a glowering sourpuss (pun intended), who was occasionally used for comic relief and made to look the fool. By this I mean that Panthro had one crippling fear in the original series. It was never explained, but it really did not need to be. Some people are afraid of things for no conceivable reason; you ask them why this or that frightens them, and all they can say is it does. What could scare the strongest Thundercat, you ask? Bats. For the 2011 series, the writers made Panthro afraid of heights. They also made him unable to swim. Previously, every member of the Thundercats could swim. They may not have enjoyed it all the time or to the same degree, but they all knew how to swim. Taking that away from Panthro, making him afraid of water and heights – it made him seem like a big baby who was frightened of anything he could not hit or blow up. That was and remains a wrong choice on the part of the new show’s writers, since it directly interfered with Panthro’s role in the story. Instead of being the strongest Cat in mind and body, Panthro was reduced to being merely strong on a physical plane. The new show’s writers cut out his real heart and put a mechanism in its place, which upset me quite a bit. Another change I found less than pleasant was the scar they put over one of his eyes. Then the new show’s writers cut his arms off above the elbows. That was the last straw. Bad enough they disrespected his strength, to go so far as to make him a double amputee in need of mechanical arms was a bridge too far. Laughing warriors are in short supply in current fiction, readers, as proved by the 2011 writers’ mistreatment of Panthro. Strong heroes are also going out of style. Nowadays a laughing warrior is portrayed as a bloodthirsty psychopath, while strength usually equals stupidity. Both these depictions are harmful stereotypes which must be abandoned if fiction is to continue to be a vehicle for truth. Panthro is not the only strong, laughing warrior in literature, of course, but he was one of the best. New writers could learn a great deal about making tough, hearty heroes by studying him. And I mean studying him for love of their craft, not for love of money. We saw the results of the latter in 2011; the finished 1980s product is far superior to the one the new writers handed us. So if you are a fiction writer, and you want to know more about Panthro, I recommend you look up the original series. The 2011 show did not do him justice; neither did the comics, in large part. And please remember that a happy warrior is not a psychopath or a maniac who likes killing, destroying, or maiming. A happy warrior looks and acts like Panthro. So does a strong hero. We need more of both. This entry was posted in TV Shows and tagged cats, children's animated tv shows, Earle Hyman, fear, fears, Jackalmen, Kevin Michael Richardson, Panthro, Science Fiction TV Shows, Star Trek, Thundera, Thundercats, Thundercats 2011, TV series, TV Shows, Vulcans on January 26, 2018 by The Mithril Guardian. Well, I did not begin posting about Star Trek fiction as soon as I had hoped. 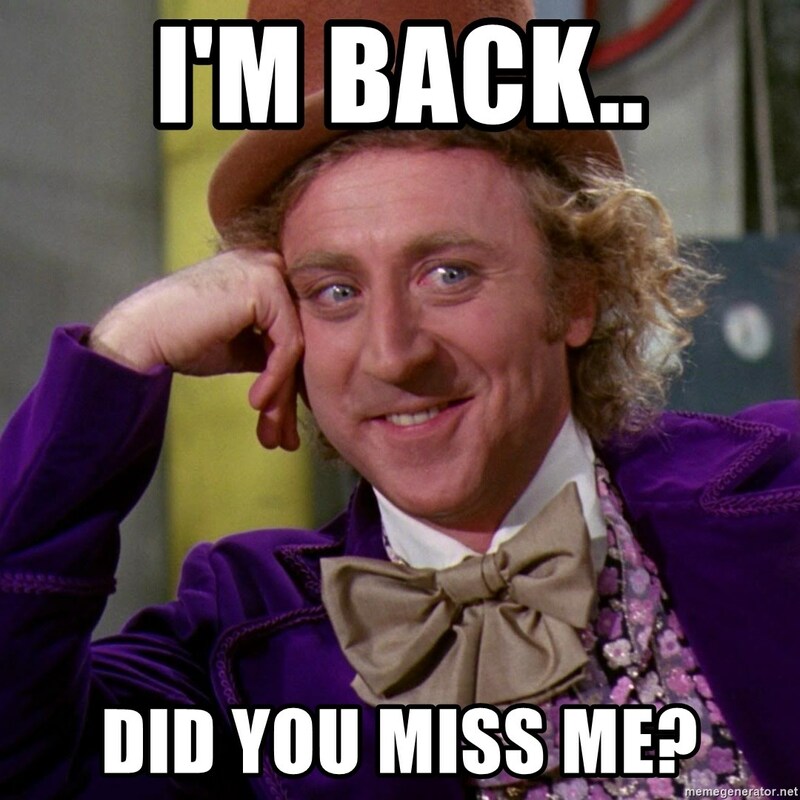 But better late than never, right? Today’s focus is Star Trek: The Great Starship Race by Diane Carey. If you were to type the title of the book into the search engine of my blog, you would come up with several quotes from the novel posted here. Not nearly so many as you would get if you typed in The Cherokee Trail, but you would get a good number nonetheless. 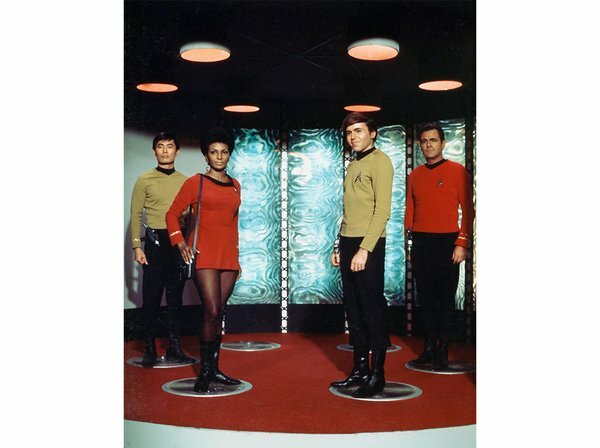 The Great Starship Race takes place in the Original Star Trek series timeline. 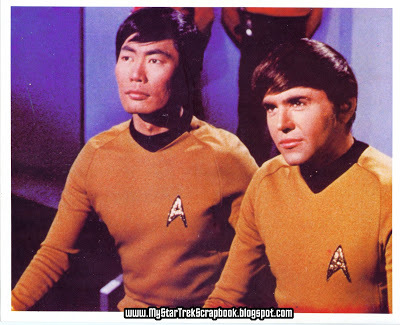 It focuses primarily on Kirk and his point of view, with occasional shifts to McCoy’s perspective. But The Great Starship Race actually begins from the viewpoint of Valdus, a Subcenturion on the Romulan ship Scorah. The Scorah and its supporting Swarm are out patrolling a sector of Romulan space when they stumble across an old spaceship with barely any warp capabilities. Picking up the ship, they find five aliens aboard, aliens sent on a mission of exploration from their homeworld in the hopes of finding other life in the galaxy. All of them die except for one: Valdus. He is the only one to escape the conflagration, the only one to come back to sanity. He is therefore the only one to realize how dangerous these aliens are to the Romulan people. Fast-forward eighty-six years. The Federation ship U.S.S. Hood, under the command of Captain Kenneth Dodge, made contact twelve years earlier with the people of Gullrey. Now, twelve years later, the Rey are about to be accepted into the Federation. And they are so happy about it that they are throwing a party, which will hopefully become an annual event: the first Great Starship Race. 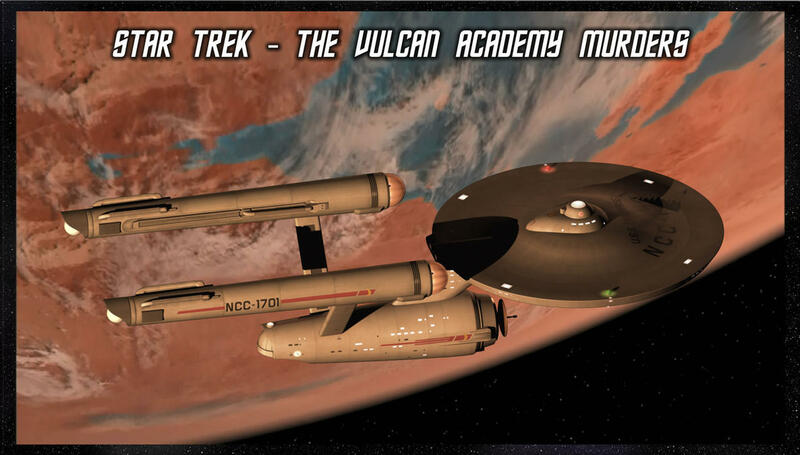 Among the competitors are four Starfleet ships – including Captain James T. Kirk’s U.S.S. Enterprise NCC-1701. Captain Kirk is looking forward to the race on several levels. Races are part of sailing history, so as a historian he is naturally happy to be participating in a race, the way that the sailing captains of the past once did. On another level, he is looking forward to showing off his ship – his “favorite girl.” And how can participating in a race not be fun? He finds the answer to that question soon enough, when they are on their way to Starbase 16. The starting line of the race, Starbase 16 sends a frantic call to the Enterprise about a Romulan heavy cruiser which has crossed the Neutral Zone. It is headed for the base and transmitting interstellar truce. What, you ask, is the Romulans’ reason for violating the Neutral Zone between Federation and Romulan space? Oh, nothing really important – they just want to join the race. If it were not such a dangerous situation, Kirk would laugh about it. But a Romulan heavy cruiser in Federation space, whatever their proclaimed reason for entering, is no laughing matter. He finds it even less funny when he meets the commander of the Red Talon: Valdus. And Valdus is none too happy when he sees Kirk. Loathing using view screens for first meetings, Valdus sees something in Kirk’s eyes that disturbs him. He knows Kirk is not a man who will give up, and that could be a problem. That is all I am telling you, readers. 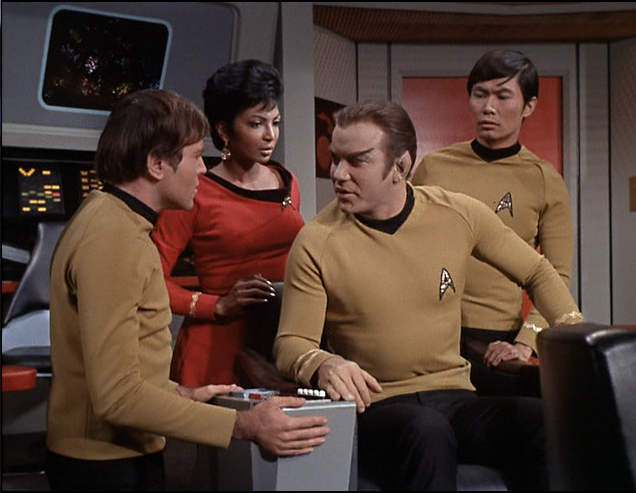 The Great Starship Race is a really good piece of Star Trek fiction. 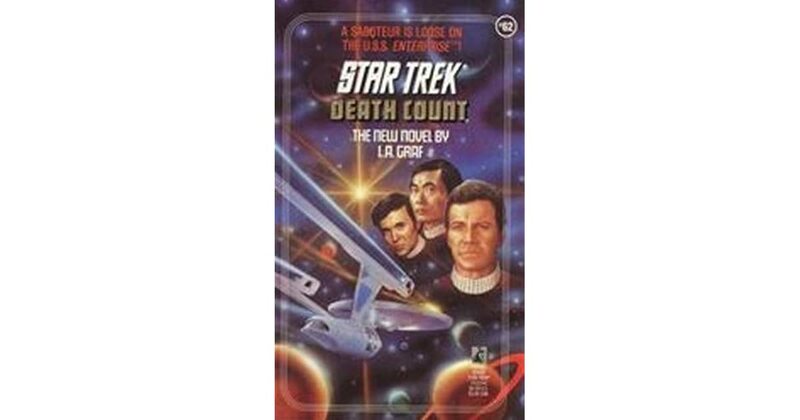 I think that it was one of the first Star Trek novels which I read. The entire Enterprise Seven is present and accounted for, though Chekov gets short shrift in the dialogue and action departments. Still, he is there. That is what counts. 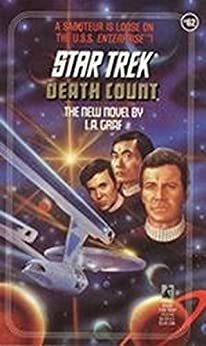 I do not know if Diane Carey wrote any more Star Trek fiction. I think she did. Either way, The Great Starship Race is a Star Trek story which I highly recommend to you. So warp on over to the nearest library and see if they have a copy! If they do not, then you should request it. This is a story that ought to be on at least one set of library shelves! 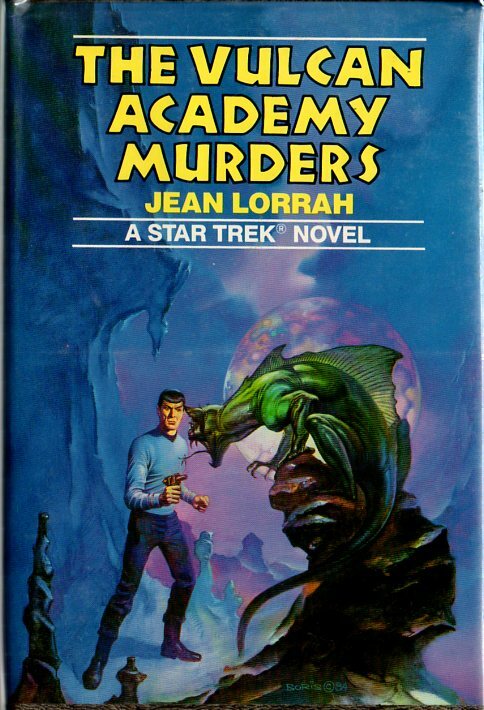 This entry was posted in Book Reviews, TV Shows and tagged Aliens, Book Reviews, books, Captain James T. Kirk, Commander Spock, Diane Carey, Dr. McCoy, Mr. Spock, QuotesStar Trek: The Great Starship Race, Romulans, sci-fi, sci-fi books, sci-fi novels, Star Trek, Star Trek The Original Series, The Cherokee Trail, The Great Starship Race, TV Shows, Vulcans on January 20, 2017 by The Mithril Guardian.